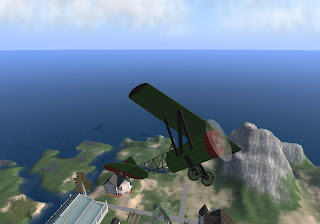 Not a Second Life Blog, but it is a very cool aviatrix blog! ".....A chick helicopter pilot fighting fires during the summer all over the U.S. as a contract pilot and during the winter flying for Corona Police Department, aerial construction flying, ferry flights across the U.S., frost control, and some news flights in Los Angeles....."
Dogfight Weekend over the Firth of Caledon! Meet at the Connolly Aerodrome in Caledon Penzance for a pilot roll-call and briefing. Go ahead Jefferson Davis! Make my day! 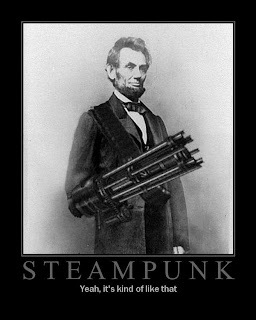 A new steampunk podcast is in production! 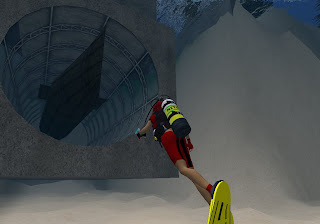 A machinima of my second scuba dive. 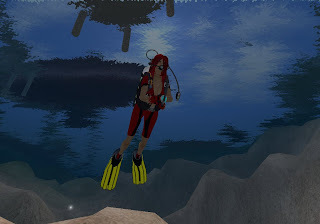 This one was in the Sailors Cove sims on Sunday 02/24/2008. Ooooo! A submarine base at Caledon Cape Wrath! 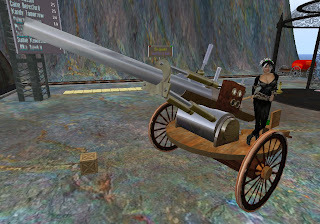 Miss Kara Wind shows me the latest in land-mobility for large scale deployments. Our new land-mobile Ironclad! 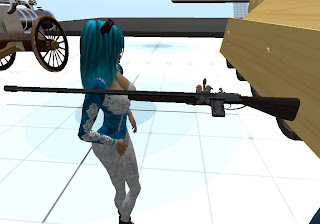 Here is one of our new rifles developed by Miss Carricre Wind and augmented by Miss Kara Wind. 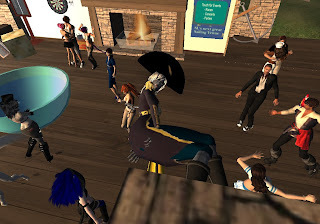 Special thanks to GoSpeed and Rav for hosting the Second Life Bloggers Party held on Sunday 24 February 2008. The latest party was held in Sailor's Cove. One of my favorite sims in SL. My friend and RCAF target Crap Mariner defying gravity. Miss Food looking...dare I say it?....looking delicious! Dinee and Doc....the happy couple! 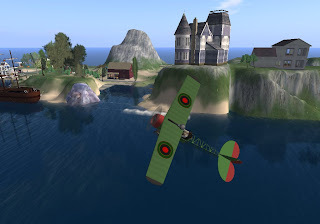 Each Saturday and Sunday at 9:00 - 10:00 SLT - Royal Caledon Air Force officers engage in Dogfight exercises over the Firth of Caledon. We meet at the Connolly Aerodrome for a briefing and then rendezvous over Middlesea. I met with Kara Wind today. 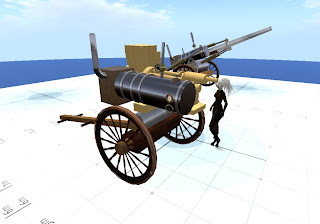 We had a discussion about several weapons and flying machine projects. Great things are coming! 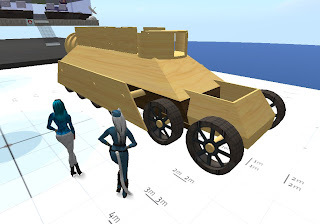 Between SimplyAmy Iwish and Kara, I have a great team of R & D Engineers working on more steampunk vehicles and weapons for the Royal Caledon Air Force. They add another dimension to my team of builders and scripters working to make RCAF strong and vital within Caledon. Virrginia Tombola and I got a mention on the WeGame.com Blog! 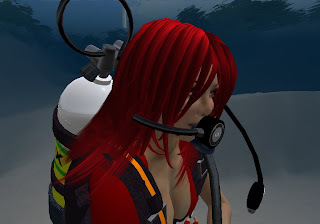 Just a quick little patch released to improve hooking in general, but in particular to help out Second Life users that may have been experiencing some pretty severe issues when they tried to start recording. Thanks to all those who helped us out with this release, particularly our users ZoeConnolly and Virrginia. 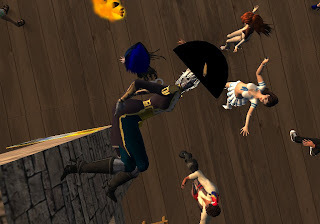 Second Life should now be working properly. 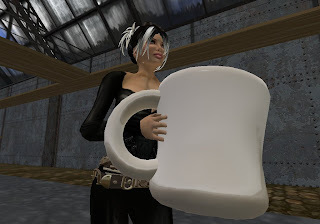 If there are any other issues, or would like to see more games included, please let us know at help@wegame.com....."
Whew, another Monday is here! New Royal Caledon Air Force recruit and arms manufacturer Kara Wind. 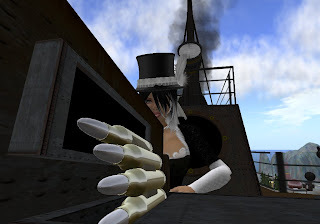 Miss Wind is a builder of finely crafted Steam Cannons and quite soon, rather smashing Gatling Guns. The Itinerary for the Sunday 24 February Second Life Bloggers meet is fairly basic. The main hostess will be GoSpeed Racer and Ravishal Bentham will be the DJ for the event. In addition to music and dancing there will be a few parlor games like Greedy Greedy, Darts and Pool. There is also a hang glider platform too. The last hour of the meeting we will have a grand sail and anyone with any sort of boat is encouraged to rez them and sail all 15 sims in the estate. If you have no boats then there are more than enough seats to go around. Sailors Cove estate is a family oriented sim so keep the clothing and language modest. No weapons either! Areas out side the commercial district and water ways are private residences, please do not intrude. Please contact me or Ravishal Bentham if you have queries or ideas for the party you would like to share. 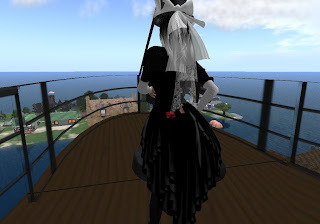 Saturday, I attended the Stanford Metaverse U conference in Second Life. The venue for the event was the SciLands' auditorium where I sat in the back row until one late-arriving gentleman decided to sit on my head. After a few unheard protests to the gentleman from me, I promptly stood-up and walked over to the first row. Is getting Sit-on a new form of being Hit-on? I was not impressed! 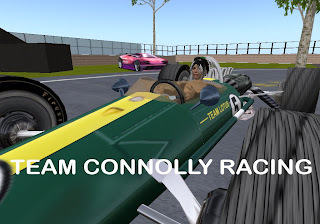 Here I test not only the new WeGame Application Driver (as recommended by the chaps at WeGame.com) but also my driving skills for my new Lotus Racer. Hmmm, not much difference in the video quality. It's back to the drawing board for the "Boys In The Lab." (crosses her fingers)....and for Team Connolly Racing it's time to schedule more practice laps. Nifty Lotus Racer though, isn't it? I'm really disappointed with the results of my WeGame Machinima in the last week. It seems no matter which SL Client I use the quality is very poor. This weekend I'll consider a few alternatives for video capture, editing, and online storage. Ugh!....So much for the simple, easy to use WeGame. Another Flight Test of the RCAF Aphid Class Gunboat HGS The Insatiable from Connolly Airfield in Caledon Penzance. 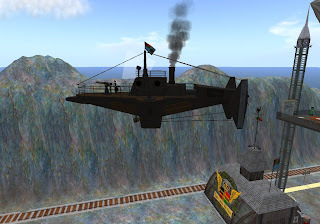 Part of my vision for the Airfield in Penzance was for the parcel to be an attraction for Second Life residents to enjoy flying - while at the same time be introduced to the world of Victorian Steampunk on the Grid. Caledon can be an intimidating place for newcomers, as it once was for me last Winter-Spring 2007. Another part of my vision was for Connolly Airfield to be Caledon's equivalent to Edwards Air Force Base, becoming a flight test center for Flight Builders and Flight Scripters in SL. Many times I am approached by inventors and asked if RCAF can test certain designs. It's a place that encourages innovation, creativity, and experimentation. I think we've been successful on both fronts. "As to just what this ineffable quality was. . .well, it obviously involved bravery. But it was not bravery in the simple sense of being willing to risk your life... any fool could do that... No, the idea... seemed to be that a man should have the ability to go up in a hurtling piece of machinery and put his hide on the line and then have the moxie, the reflexes, the experience, the coolness, to pull back in the last yawning moment – and then to go up again the next day, and the next day, and every next day... There was ... a seemingly infinite series of tests. ... a dizzy progression of steps and ledges, a ziggurat, a pyramid extraordinarily high and steep; and the idea was to prove at every foot of the way up that pyramid that you were one of the elected and anointed ones who had the right stuff and could move higher and higher and even – ultimately, God willing, one day – that you might be able to join that special few at the very top, that elite who had the capacity to bring tears to men's eyes, the very Brotherhood of the Right Stuff itself." My fist practice flight at an Air Racing Course! 5 laps total. 5 laps without crashing! w00t! 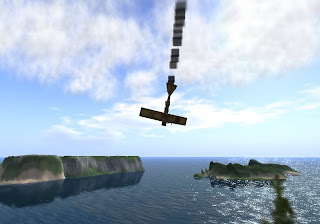 I took a few snapshots after successfully navigating the race course at Wilder Skies in my P-51 Mustang Racer. This is just pure racing fun for me! Progress continues on Connolly Air Station in Port Babbage thanks to the engineers at Edison Corporation. 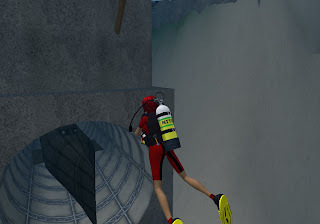 Since my first day in SL I've wanted to enter a variety of races or other contests, but due to the severe limitations of my notebook computer, I soon gave up trying to compete. All of that changed last month with my new Dell Inspiron 530 and I've become a Dual Core Evangelist ever since. My photographs have improved, I can at last produce machinima, and now...finally...I can reach a level of confidence to compete in races...Air Races! 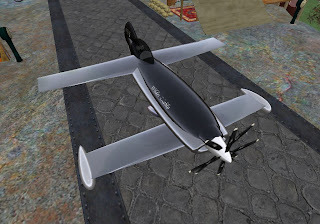 At times you may see me practice using futuristic aircraft well beyond the World War One era. I'll take-off and land at my aerodrome in Penzance and fly the Firth of Caledon. Please know that I will try to keep my flight hours limited to the wee hours when few are awake and active in Caledon. Here is my new Wilder Diablo from Wilder Skies. It's quite a sleek little flying machine and very very fast, indeed! Kristine Qinan did a wonderful job capturing most of the action from our Dogfight Training Exercises on Sunday 10 February 2008. 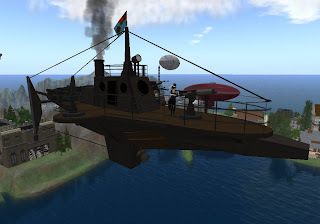 While on a regular inspection of my new Babbage Air Station in Port Babbage, I had the pleasure of a visit from Post Captain Hotspur Otoole of the Middlesea Fleet. We exchanged greetings and chatted about weapons systems, ship christenings and such. Due to the sensitive nature of our conversations about new weaponry I cannot reveal more and a film of a new vessel is now considered classified TOP SECRET. Mr Syxx Craig of the Edison Corporation goes to task quickly. 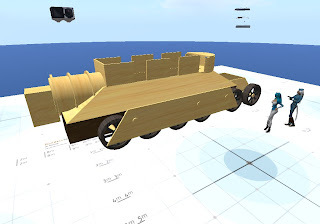 Within minutes I see the Babbage Air Station Hanger take shape - with appropriate textures added soon after. Well done Mr. Craig. Mayor Sprocket gave me a quick nod in approval of the project. My land holdings grow once again! 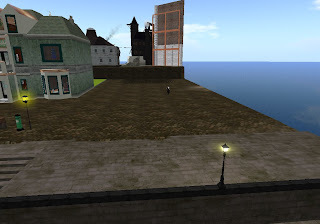 My very first Victorian Steampunk lot was a rental flat in Babbage Canals in New Babbage. I've rented that space since May or June 2007 and have always searched for a suitable lot for a project. Here are a few photographs of my new 2048 parcel in Port Babbage. I've commissioned the fine talents of Mr. Syxx Craig of the Edison Corporation to build a suitable structure worthy of the surrounding area. 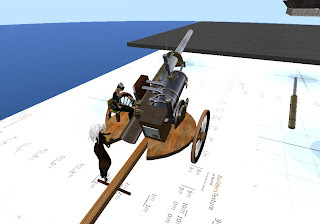 Special thanks to the former Majestic Navy of New Babbage and Admiral Titanas Vella. This is the site of the old Admiralty House. The parcel will now be known as Babbage Air Station where Mr Craig was last seen busily building a hanger structure. "It's sad to lose a friend..."